On 30 January 1889, Franz Ferdinand Karl Ludwig Josef von Habsburg-Lothringen-Este became the heir presumptive to the Austro-Hungarian throne. In the years between 1903 and 1913 Serbia engaged in a number of disputes with its neighbours. It was against this volatile background that Franz Ferdinand, with his wife, Sophie, visited Bosnia at the invitation of General Oskar Potiorek, the governor of Bosnia. The Serbian Black Hand, a terrorist group, decided to assassinate Franz Ferdinand and hired three 19-year-olds suffering from tuberculosis to kill the archduke. They were Gavrilo Princip, Nedeljko Cabrinovic and Trifko Grabez. Each of them was given a pistol, two bombs and a phial of cyanide with which to commit suicide after the event. On arrival in Bosnia-Herzegovina they were met by half a dozen more assassins: Vaso Cubrilovic, Veljko Cubrilovic, Danilo Ilic, Misko Jovanovic, Muhamed Mehmedbasic and Cvijetko Popovic. Seven of the would-be assassins mingled with the crowd as the royal couple travelled in a motorcade to the town hall. The first opportunity fell to Mehmedbasic but he lost his nerve and stood watching the motorcade pass safely by. The second assassin was Vaso Cubrilovic next to Mehmedbasic, armed with a revolver and a bomb. He, too, did nothing. Nedeljko Cabrinovic threw his bomb but the chauffeur saw it heading towards the car and accelerated. The bomb hit the roof of the vehicle and bounced off, exploding under the following car, wounding two of the occupants and 20 people in the crowd. Cabrinovic swallowed his cyanide pill and jumped into the Miljacka River. However, the poison did not work and he was dragged out and beaten up before the police arrested him. By coincidence, the car was in the street where Princip was in the café. As the driver began to reverse, Princip strode up and fired twice from less than a metre (3ft). 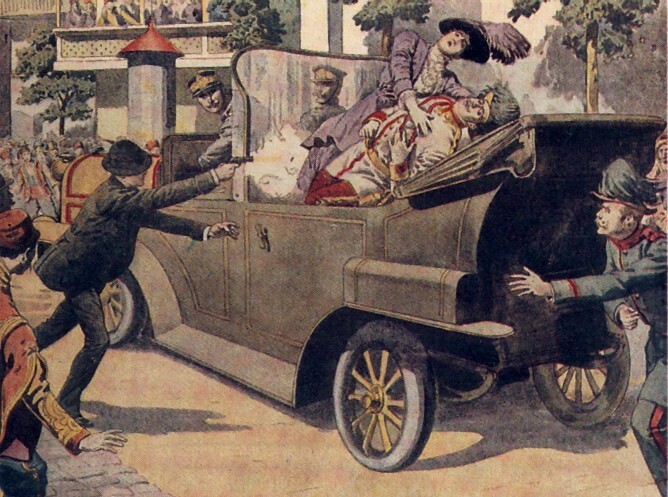 The first bullet hit Franz Ferdinand in the throat and severed his jugular vein; the second hit Sophie in the abdomen. He called out, “Sophie, Sophie! don’t die! Live for our children!” Sophie died 15 minutes after being shot, the archduke shortly afterwards. Princip was arrested and along with Cabrinovic was tortured and gave the police the names of their fellow conspirators. They were all arrested and charged with treason and murder except Mehmedbatic who escaped to Serbia. On 28 July 1914 the Austro-Hungarian Empire declared war on Serbia. The arms race of the previous decade had precipitated treaties and alliances. In consequence, countries began by declaring war on one other so that by the second week of August 1914 most of Europe was involved in a bloody conflict that would cost millions of lives and last more than four years.